The Baader Hyperion 8-24mm Clickstop Zoom continues the Hyperion tradition of delivering top-of-class performance and quality, at very reasonable prices. 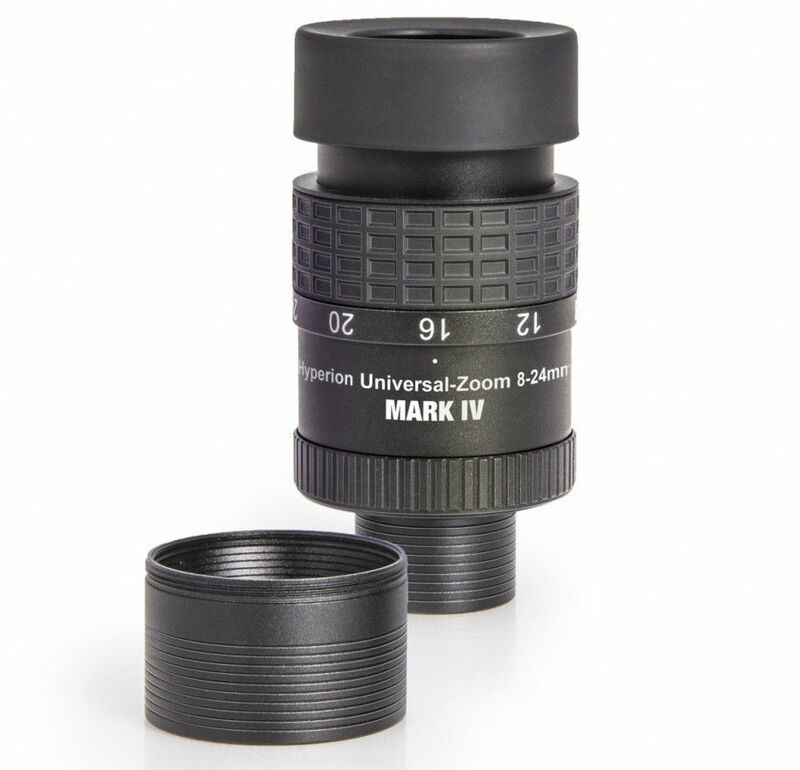 Zoom eyepieces have earned a lackluster reputation over the years, due to their compromises in optical design and execution. We think the Hyperion zoom will surprise many jaded zoom users with its combination of performance, quality, and novel features. Consisting of 7 elements, the Hyperion optical design delivers outstanding sharpness and color correction over its wide flat field, even with fast telescopes. Users are reporting that the Clickstop Zoom matches the performance of their best fixed focal length eyepieces! As with the fixed focal length Hyperions Baader Planetarium has gone to great lengths to give the Hyperion Zoom the most advanced multicoatings ever used on amateur telescope eyepieces. The Hyperion Phantom Group™ multi-coatings truly rival the best in the world – including the famous Zeiss Abbe Orthoscopic! The difference in contrast and transmission is clearly visible at the eyepiece. Includes both 1.25″ and 2″ Barrels. The 2″ barrel attaches through an included adapter ring that has standard 2″x24tpi SCT threads. The 2″ barrel also incorporates a reverse taper groove for better seating and retention. Superb fit and finish. Zoom motion is smooth and precise. Barrels are accurately machined, with excellent surface quality, and hard anodizing. The 1¼” Barrel is threaded for standard 1¼” filters, and the 2″ Barrel for standard 2″ Filter. Hyperion Digital T-Rings, for direct attachment of virtually every digital camera, camcorder, CCD Camera. Be the first to review “Hyperion 8-24mm Clickstop Zoom” Click here to cancel reply.